The best part about being a REACH Scholar is that I finally have my mind set on the future. I have learned about different ways to get into college without having to pay as much. 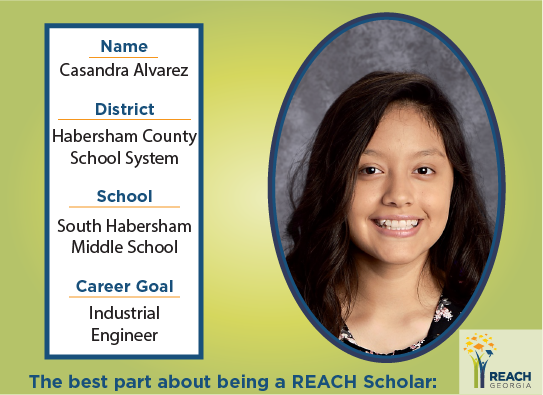 Now that I am a REACH Scholar, I am more focused on what career path I want to focus on. Having financial help has put not only me, but my parents as well, at ease knowing that I will be able to go to college. My future outlook has changed drastically since being chosen as a REACH Scholar. Before, I has absolutely no clue what career path I wanted to choose, but now I have considered my options. I believe that being an engineer is something that interests me greatly. This opportunity that has been given to me is something that I will always cherish and be forever grateful for because as a student and daughter, I have something I am working towards.